ICE WINE COMMETH: December 2013 UPDATE. Record-breaking low temperatures in portions of the Pacific Northwest made it ideal conditions for the picking grapes for ice wine. Ste. Michelle Wine Estates harvested and began crushing grapes at Columbia Crest in Paterson, Washington, after temperatures in the Horse Heaven Hills dipped to 10 degrees. Frozen berries of Riesling on the vine are about to be picked near Paterson, Washington. It's also happening in British Columbia’s Okanagan Valley, where conditions made for one of the earliest harvest of ice wine. Frigid temperatures produce a winter gift for Washington wineries. Remember that 2008 winter bitter cold weather? Well it had a delicious upside. 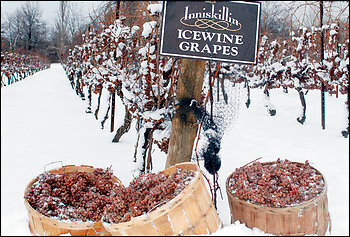 It has allowed Northwest winemakers to harvest the rare and delectable Ice Wine. Ice wine (or icewine, as one word, or in German, Eiswein) is a type of dessert wine produced from grapes that have been frozen while still on the vine. 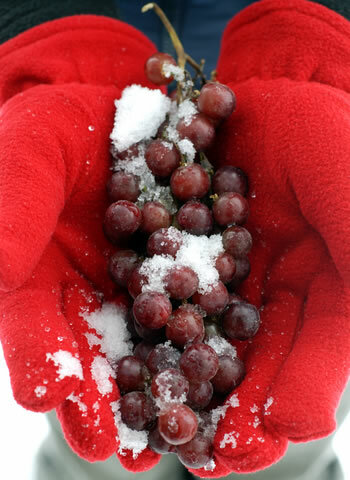 The sugars and other dissolved solids do not freeze, but the water within the grape does. This results in a smaller amount of a more concentrated or very sweet wine. Ice Wine is sweet balanced by a high acidity. Yes, you can drink your dessert. A small amount of ice wine is made in Washington and Idaho. Some wineries make “ice wine” by picking late-harvest grapes, then freezing them. The resulting wines are not as good as the real thing, although they are generally much less expensive. Changes in laws in 2003 forced wineries that make such wines to label them as something other than ice wine. This allows the consumer to spot a fake and as we know a faux isn‘t always a bad thing. But now when you see “Ice Wine” on the label, you know you’re getting the real thing. To make a "true" Ice Wine, grapes are left on the vine long after harvest and are picked by hand once temperatures reach a certain level, usually about 17 degrees Fahrenheit (-8 Celsius). Its common for wine workers to trudge through snow in the middle of the night to pick the grapes. These frozen grapes are then crushed. Since they are frozen, just a few drops of sweet juice is released and fermented. Because Mother Nature needs to cooperate and it’s hard to make with so little juice coming from the harvested fruit, ice wine tends to be expensive. For these reasons ice wine is often offered in small half-bottles. The best ice wines are those that retain natural acidity in the face of late harvests. Riesling is one of the finest varieties for ice wine because of its ability to withstand the cold winter temperatures. A few wineries also are experimenting with red ice wines, using Pinot Noir, Merlot and Cabernet Franc. Chateau Ste. Michelle is Washington State’s oldest winery, established in 1934. The winter of 2008 is just the sixth time in the winery’s history, that it produced an Ice Wine. All thanks to arctic weather and snow blanketing most of Washington State that winter. See, there’s the upside for Washington winos when it comes to the chilly weather. Grapes were picked in the snow-covered Horse Heaven Vineyard at Columbia Crest in Paterson, Wash., with temperatures at being ZERO degrees. Chateau Ste, Michelle is harvesting the marble-hard Riesling grapes to produce a true Ice Wine. Workers picked 10 tons of grapes measuring 49 brix (a measurement of sugar), which produced about 200 gallons of juice - the equivalent of about 80 cases. The wine is worth the trouble. Ice Wine is intensely rich, concentrated, with exotic, ripe flavors. Today, Canada is the world’s largest exporter of ice wines. British Columbia’s Okanagan Valley wineries produce far more ice wine than any other region in the Pacific Northwest. One to try is Mission Hill Family Estate 2008 Reserve Riesling Icewine, Okanagan Valley which won the Best of Show at the giant 2010 Northwest Wine Summit. While Washington winemakers are not assured as many winters of extreme cold temperatures, as do those in the more northern Okanagan Valley, winters are still quite cold. Wineries such as Claar Cellars, Covey Run Vintners, Apex Cellars, Columbia Crest and Chateau Ste. Michelle, just to name a few, include different varietals of ice wines in their lineups. In Oregon’s Willamette Valley, Duck Pond Cellars has created a Semillon ice wine for three years. You are correct. It’s hard to make wine with so little juice coming from the harvested fruit, ice wine tends to be expensive. For these reasons ice wine is often offered in small half-bottles. It's also a slow sipper. A consumer looking for "Ice wine" would go _______? and look for a wine named_______? to try this new product? The Rocket Market or VINO! have a selection of Ice Wine and also a knowledgeable staff that can discuss the options with you. I would recommend Apex Cellars (WA.) Claar Cellars, Covey Run Vintners, Columbia Crest and Chateau Ste. Michelle, just to name a few, include different varietals of ice wines in their lineups. Quite interesting, thanks for posting, excellent work. I found your site here. Waiting for more.